I always want to make sure my boys are well-nourished properly fed. But even the most organized moms can find that there isn’t always time for the perfect sit-down meals. For those times when you need something quick and easy, freezer meals are the heroes to the rescue. Here are 11 easy-to-make freezer friendly snacks for kids. English and Italian collide with these freezer-friendly English muffin mini pizzas. Simply spread on some tomato sauce and sprinkle on all your kids’ favorite toppings. Pop them in freezer bags to quickly warm up later for a meal-on-the-go. Pizza pizzazz! Recipe & directions here. PB & J sandwiches are the ultimate snack-in-a-bind. Even if you replace the peanut butter with a different nut butter of choice, it still remains that everyone ends up happy whenever these nutty, fruity, sticky, gooey, oh-so-tasty sandwiches are on the menu. Have them pre-made and practically ready to eat with this simple take on Uncrustables. Peanut butter, oats, and dried berries make up the base of these mighty bites. They can be frozen or not, but either way, they’re a great way to pack in a punch of energy for little bodies on the go! Find the recipe from The Crafting Chicks. Mornings can be tough enough as it is without thinking of making a healthy breakfast for the kids. Do the cooking ahead of time with these mini quiches and you’ll have a tasty breakfast ready in practically no time at all. You can make customize the fillings for each child’s preference or have whites-only versions as well. Eggcellent! Sometimes it’s nice just to go back to the basics with wholesome natural breads. Do away with the sauces, toppings, and mix-ins, and go instead with simple yet satisfying pretzel bites. The salt is all you need to keep mouths happy, but cinnamon and sugar make for a fun variation. Use Rhodes dinner rolls make this one super easy recipe to bake! Get hoppin’ with a frozen smoothie pop. Just whip up all your favorite smoothie ingredients from bananas and oranges to creamy yogurt and berries, leave them in the freezer, and away you go! Recipe. I resist taking my boys to fast food restaurants as much as possible. We’ve all heard the reports about the fake, overly-processed, calorie-dense “ingredients” and I would much prefer to feed my family foods that will nourish rather than harm their bodies. Frozen chicken nuggets are an excellent way to compromise! Get the directions for these SUPER tasty nuggets from Don’t Waste the Crumbs. 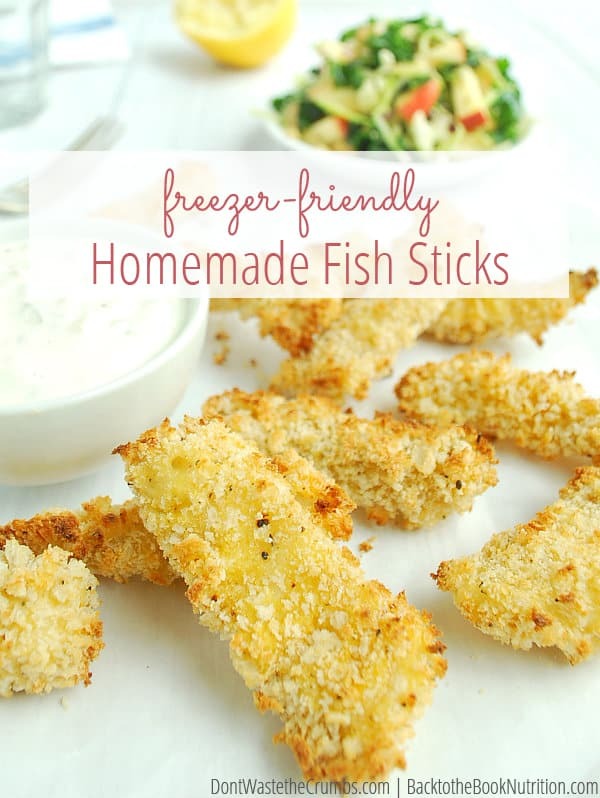 Another family favorite in our household are freezer-friendly fish sticks. Such a better (and less expensive!!) alternative to store bought processed products! Sink your line here for the directions and recipe. I think that with SO many options at the market these days, it’s easy to forget the best options of all: fruits and veggies! There’s no need to get fancy and complicated with snacks when it comes to freezing fruit! In fact, my kids PREFER to eat natural fruit over most of the packaged items found in stores. Click here to learn how to freeze different fruits for different purposes. “Feeling blue” never felt so good when it comes to frozen blueberry-yogurt kabobs! Stack blueberries (or any of your favorite fruits) on a skewer and coat them in Greek yogurt for this fail-proof crowd pleaser. I’ll be the first to admit that for as much as I prefer to feed my family wholesome, healthy food, I also know the power of chocolate! This frozen chocolate banana yogurt bark is a favorite in our home whenever we need a happy dose of chocolate. Recipe here.